I know I cribbed so much about the vacation but lot of interesting things happened too. It was also a holiday of many 'firsts' and I'm going to generously share my experiences with u. The kids & I were so tickled when we caught sight of this lil guy. It was the first time we were seeing a real live snail. We reluctantly left to go have breakfast. 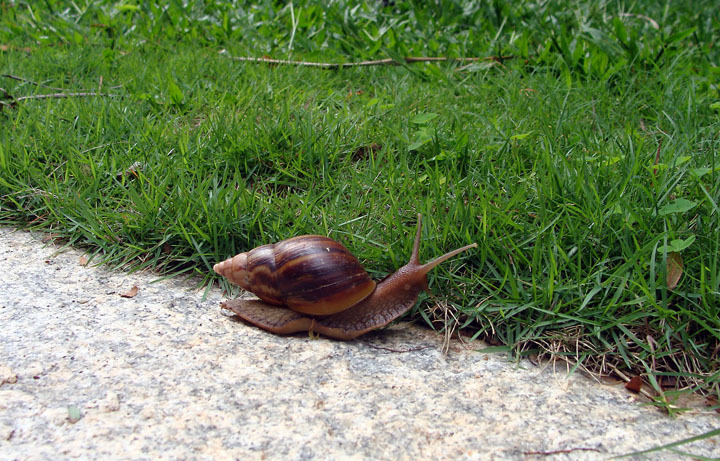 When we came back it was nowhere to be seen﻿; who ever said snails were slow need to check up on their facts. That’s the Mysore Palace. I have already seen it before. Twice actually. But I have never seen it lit up like this. Did you know it’s illuminated only on weekends....and only for an hour. It was beautiful…totally worth waiting for. Now you’ll say ‘Huh puhleeeese don’t tell us you haven’t seen a crow before’. Ofcourse I’ve seen crows. But this is my FIRST picture of one;-D. Now this crow didnt seem like an ordinary crow; it was standing there & quietly staring into the sea for atleast 5 minutes. Me thinks it was thinking philosphical thoughts. Unless it had a constipation problem. My mother-in-law slipped and fell; dislocated & fractured her left wrist two weeks back. The first step from the bottom was the slippery culprit. Clicked this from a moving train. The path looks so inviting doesn’t it???? Oh the temptation!!!! If I decided to follow my heart I’m sure I would have felt like the first woman on earth walking down that particular road. Oh all right, I'll cut the crap......I was just looking for an excuse to show off what I think is one of my best photographs. 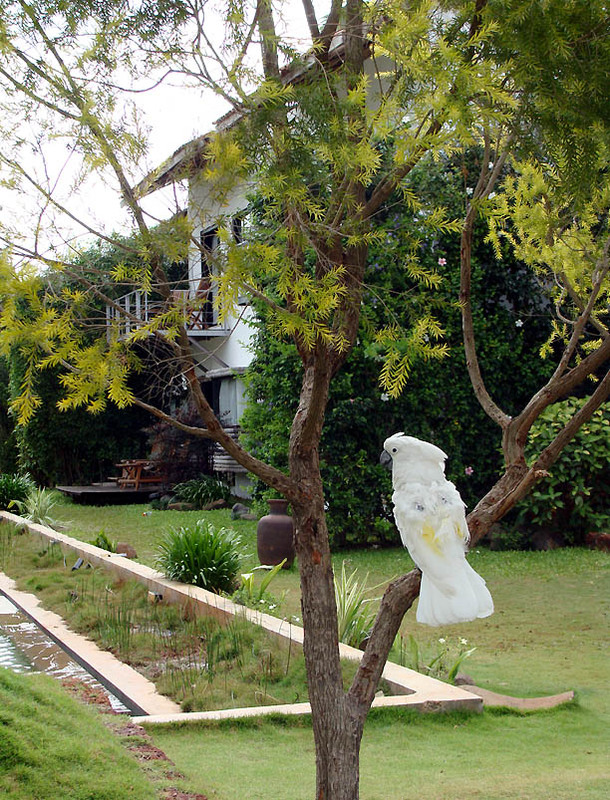 I had slipped off my flip-flops and was walking barefoot on the lovely green grass when I was introduced to this bird. Her name is Rosie. The guy who introduced her to us said she was a Macaw. She walked up to my footwear and snapped the straps neatly into two with her sharp beak. "Shoo-shoo" I waved my hands trying to stop her, then she turned & started walking towards me with this crazy glint in her eye. I backed off in a hurry. First time I met a bird named Rosie. First time a bird destroyed my footwear. ﻿My sister clicked this picture of me at the Zoo. First time I find myself in the same frame as a rhino. If I continue I'd probably be tempted to add I was the first person to conquer North-pole and I have no photographs to prove it. So I'll conclude here and request you NOT to write down the first thought which occurred to you when you finished reading this post. Unless you want to compliment me on my superior insights & complicated thought-process. Mysore Palace looks lovely! We had plans to go there - but had to cancel when all of us fell ill. Next time maybe. Those steps do look treacherous! Rosie does seem to have a very sharp beak! But how cute of her to pose so nicely for you! Jux: No hurries, take ur time;-D.
Smitha: My garden is full of them .....Next time you want ot see snails - come here :)"
shhhh dont say it so loud, my kids are somewhere around;-o. 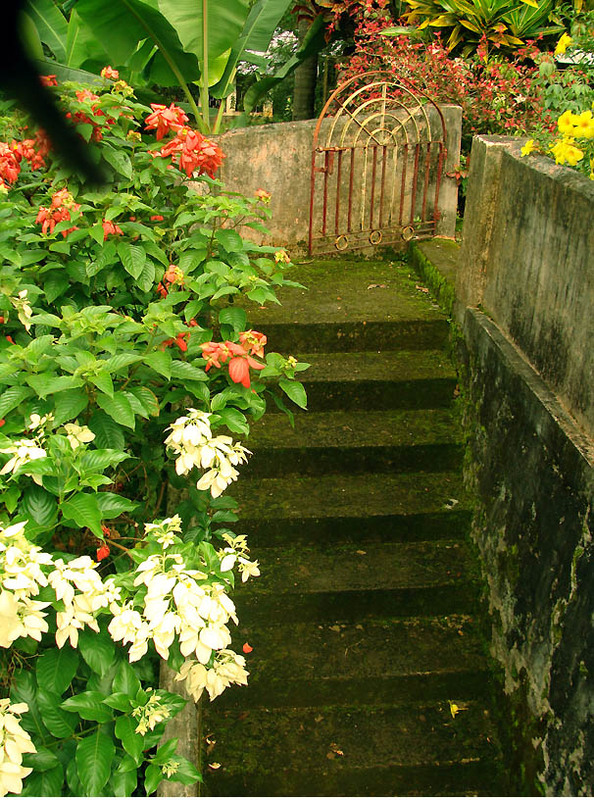 Those steps seem ok most of the time but its very slippery after the rains:-(. i love the way you have your way with words..even captions for pictures puts a smile on my face..
What? Not allowed to say what I really wanna say? Sulo: Hahahaaaa....u are the eternal optimist;-D!!!! A: Oh yes it was awesome:-))!!!! yeah, i remember that shilpa post :D Lol..! That was quite a trip, wasn't it? Liar!!! :-D ha ha! Here you come again with a winning post-- loved ALL the pictures you posted AND just laughed so hard at some of your running commentary :) You are too funny!!! You really are a great photographer...loved the picture of the path and glad you decided to add that to the collection. Lovvveed all your pictures, Nancy. Esp., 1, 4 and 5. Picturesque. And only you could make a picture post as interesting. My god, your MIL fractured her wrist on this steps? All is not well with everything beautiful, isn't it? 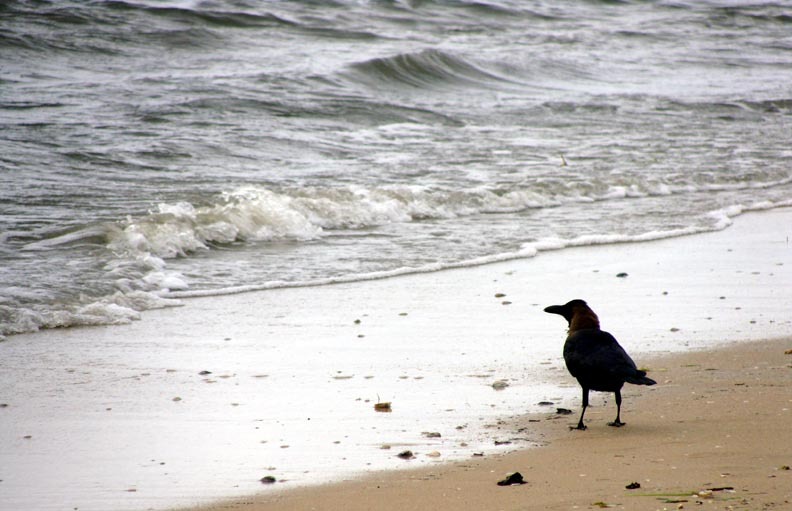 The crow seems to be lost in thought! Is there anyway, I can see the other side of the last picture, please? Will flipping the picture help?? My full hearted compliment on your superior insights & complicated thought-process. lovely pictures..i loved those stairs, if they are so beautiful, how beautiful your house would be? Sulo: Mysore palace is a must visit atleast once kind of place. If u ever get a chance go see it:-). Pythoroshan: What sharp eyes u have Doctor;-D...yes its Windflower, Mysore[the snail & rosie pics]. Lovely place, quiet & restful yet has enough to keep adults & kids occupied:-). Swaram: My mil was in a lot of pain bcoz of the dislocation. She still wears a cast but she's much better now. Thanks:-))!!! Snow: LOL I can just picture ur reaction;-D. U knw this used to happen to me with Ladybirds...they wd play dead but wd scurry away within seconds when I put them back on the ground. Anjuli: Oooooh Thanks!!!! Ur comments have the knack of putting a blogger on top of the world:-D!!!!! RS: Tender-hearted as ever, I can imagine u so clearly picking up snails fr the road and putting them on the pavement:-)). Ramesh: Thanks:-))!!!! In case u r wondering, it was the 'full-hearted' that did me in;-D.
Renu: Thanks!!!! Our house is also beautiful....built on top of a hill. Old fashioned some people wd say but we love it:-)). Loved the pictures and laughing out loud on the captions except for where your MIL slipped and fell..
Lol these are some 'first's worth reading ! 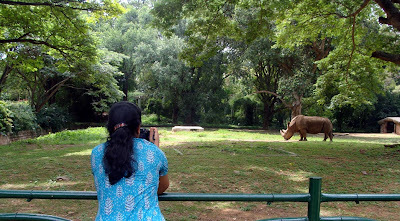 Same frame as a rhino :D lol ! ermm....did u mean to add 'blogger' after the female. Coz right now I feel like Malaika Arora in Dil Se...u know item number types;-D.
Jokes apart, yep I got ur mail and am so sorry I didnt reply. And hey thanks for the compliments;-D!!!!! Anita: They are, arent they;-D!!!! Thats a lovely shot of the snail. I'm yet to see a live one. Mysore Palace looks beautiful! Its been there in one of my must-visits for a very long. 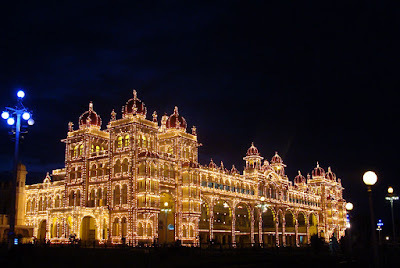 Its a pity that I have been to BLR so many but never have we had a chance to go to Mysore :(. Ayyo, how's your mom-in-law now? I have observed such slippery steps a lot in kerala, they are so dangerous, arent they? 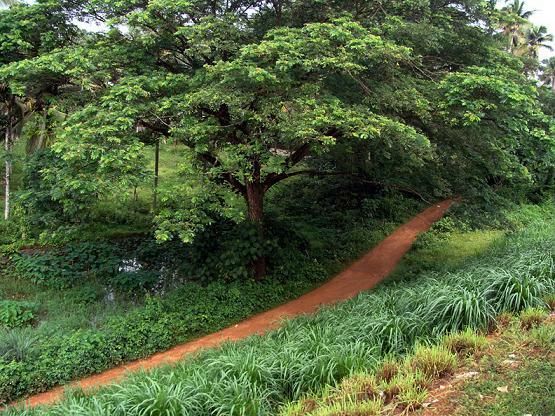 Thte path does look inviting and you clicked it from a moving train..wow! it has come out really well! Whenever I try a hand at photography in a moving vehicle, it invariably come out all shaky and horribly blurred! all these pics are so very b'ful! moss makes stones slippery, hope ur ma-in-law recovers very soon. am still in office.... :( sniff! wana go homeeeeeeeeeeeee! Deeps: MIL is better now...they'll remove the cast in 2 weeks:-). AS: Yeah moss looks beautiful but is very dangerous;-(. Sulo: Ohmigosh its been 3 days now....give ur boss a strong dose & go home at once;-D.